Summer is the perfect time for fool. This cool, creamy dish is better known in Great Britain than the United States but used to be common here as well. Fool refers to cooked fruit mixed with custard or whipped cream. The term was once thought to be derived from the French fouler, meaning to crush (as in berries), but the Oxford English Dictionary dismisses this idea since the earliest fools didn’t contain fruit. The dessert may have been considered simply foolish and insubstantial, somewhat like trifle, its culinary relative. In fact, the terms fool and trifle were used interchangeably for many years. The OED cites a 1598 reference to “a kinde of clouted creame called a foole or a trifle.” According to Richard Sax, author of Classic Home Desserts, these two desserts were originally considered “strictly rural fare, not worthy of a sophisticated table.” But in the 18th century, they became quite fashionable. By this time, trifle referred to a dessert made with biscuits or sponge cake, custard, jelly or jam, and alcohol, with syllabub (whipped curdled cream) on top. Some early fool recipes were made with eggs and no cream, or with some kind of bread, like trifle, but by the 1700s, most were a combination of fruit blended with milk, cream, or custard. (Whipped cream was not used in fools until the late 19th century.) Gooseberry was the most common fruit, but eventually others were used, such as strawberries, raspberries, rhubarb, plums, or oranges. I wanted to make gooseberry fool, but actually finding gooseberries was a challenge. The fruit is common in Europe but is now rare in the United States. This might be partly because the berries are sour, and not to our modern American taste. Gooseberries are also prohibited in some areas of the country because they host a fungus that causes white pine blister rust, a scourge of pine trees. 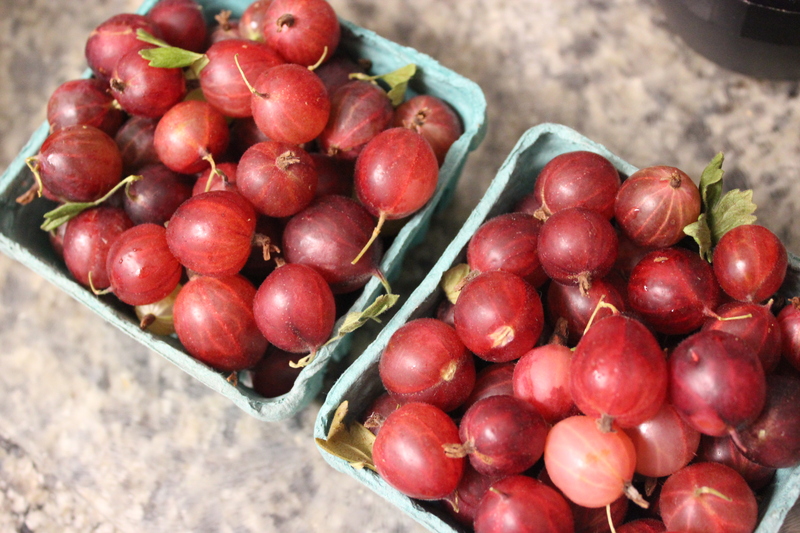 I finally found some gooseberries at a farmers’ market, and learned that they are only available in my area for two or three weeks each summer. The berries are green or red, greenish inside, and look sort of like giant fuzzy currants (the fruits are related). Scald two quarts of young gooseberries till they are soft, put them through a hair sieve with the back of a spoon, sweeten the pulp very well. When cold, mix it with a little thin cream or milk till it is smooth, then add thick cream; mix it well, and send it to table. N.B. If you like the seeds, put the gooseberries when scalded through a cullender instead of a sieve. Hair sieves had a bottom made from horsehair or camel’s hair. I actually saw one dating to circa 1850 on eBay for $175. Fortunately, a fine-mesh sieve will work well instead! Gooseberry fool recipes were common in 19th century cookbooks both in England and America, including The Virginia Housewife (1831), Miss Leslie’s Directions for Cookery (1851), and Mrs. Beeton’s Book of Household Management (1861), as well as a number of post–Civil War cookbooks. But fool seems to have become scarce in the U.S. by the 20th century. It remained popular in England, however, along with trifle and Eton Mess, which is like a whipped-cream fool but also contains meringue. I decided to make a whipped-cream fool with my gooseberries, drawing on Taylor’s recipe above and one by English food writer Nigel Slater. See my adaptation below. It was easy and tasty, but the berries were very tart. You can add more sugar if you like, but it’s meant to be a little tangy. 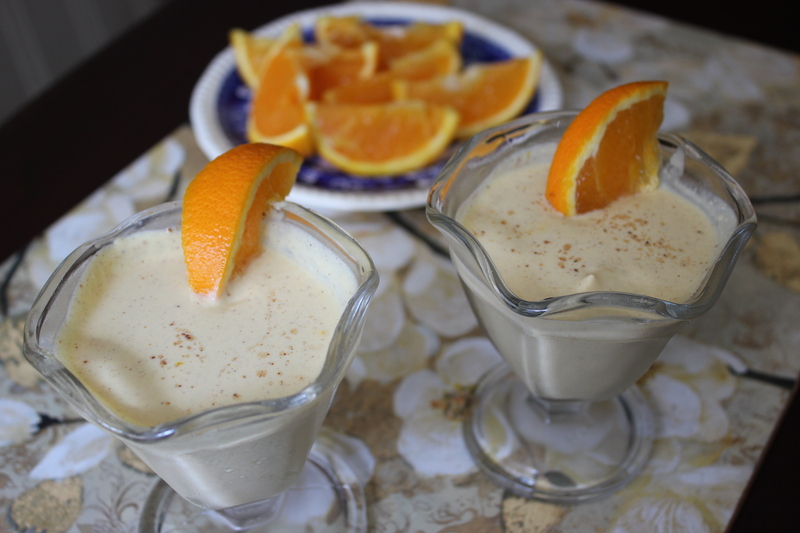 TAKE the juice of six oranges and six eggs well beaten, a pint of cream, a quarter of a pound of sugar, a little cinnamon and nutmeg. Mix all together, and keep stirring over a slow fire till it is thick, then put in a little piece of butter, and keep stirring till cold, and dish it up. This dish looked simple but turned out to be challenging, as it was hard to keep the eggs from curdling. You must stir the mixture constantly over a low heat and not let it boil. This fool is very mild in taste, but I liked it, especially when it was still lukewarm. These two fools were quite different, but both were good. I also plan to try some modern fool recipes this summer, like Tropical Pineapple, Mango, and Coconut Fool (lightened with Greek yogurt) on the Serious Eats website. I may also make a few trifles, and have my eye on the Food Network’s Berry Trifle. From Hannah Glasse to the Food Network, egads! And this brings me to my next subject, that I may not be blogging for a while. Okay, I know what you’re all thinking, she’s always on hiatus. But seriously, I seem to be short on time and have other creative (and some noncreative) endeavors to pursue right now. The blog will still be here, however, and I’ll be back eventually. In the meantime, happy summer! 1. Wash the gooseberries, and trim off their “tops and tails,” the stem and flower ends. In a medium saucepan, combine the berries with 1/3 cup sugar and two tablespoons water, and bring to a boil over high heat. Reduce heat to low and simmer berries for about 10–15 minutes, or until the fruit begins to burst. Cool mixture to room temperature. 2. At this point, if you don’t want seeds in your fool, strain the berry mixture through a sieve into a bowl, pressing on the berries to extract the juice and pulp. Otherwise, simply crush the berries with a fork or other masher. Refrigerate the mixture until cold. 3. In a large bowl, whip the cream until soft peaks form. You can add an additional 1–2 tablespoons of sugar and blend if you prefer to have sweetened cream. 4. 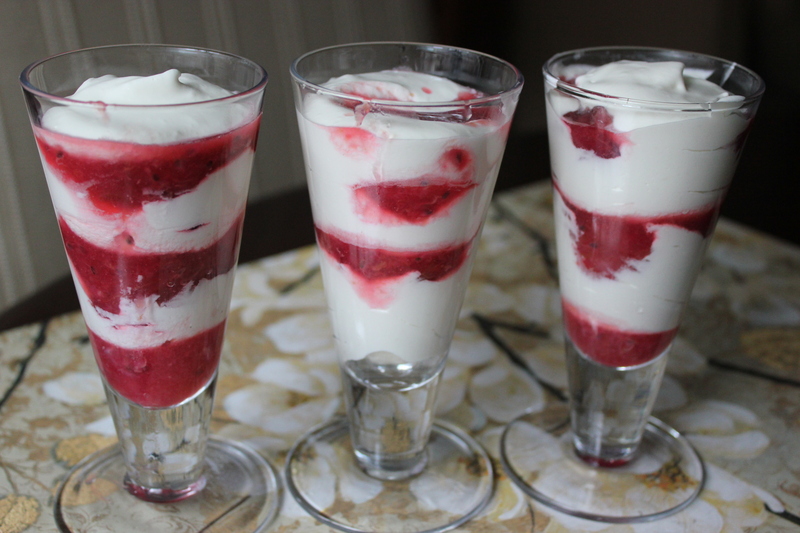 Alternate layers of the berry mixture and cream in parfait or other glasses or bowls, or blend completely to form a pink cream if you prefer. Cover with plastic wrap and refrigerate until serving. Serves 6. This entry was posted in desserts and tagged Cooking, cream, Custard, food history, fool, gooseberry, Hannah Glasse, orange, trifle, Whipped cream by revolutionarypie. Bookmark the permalink. Hi Karen! I’ll look forward to your return. Thanks for another great post! Love the food history! I’ve made things from Hannah Glasse’s book and have also found them to be challenging. I suspect there are underlying assumptions that are lost to 21st century cooks. I miss my UK garden’s gooseberries here in Greece. Glad you were able to find them in your farmers’ market. Yes, I think Glasse would be shocked/amused by the precise measurements and instructions in modern cookbooks. About the markets: I wish I could find more of the “old” fruits, like huckleberries. I used to pick huckleberries when I lived in PA! Good luck finding them. They are exceptionally good. Thanks so much for the nomination, Michael. I’m going to respectfully decline since I’m taking a blogging sabbatical, but I do appreciate it. Your blog looks wonderful, BTW. Per usual, a delectable and compelling post. I was hoping to see if a post on Orange Fool might tease out the Internet crazies but glad you went with the gooseberry – looks deelish! Will look forward to your blog return this fall! Thanks, Toni. I might be on hiatus longer than that. You’re welcome — enjoy the gooseberries! Hi Victoria. As far as I know, the first recorded references to the dish were in the late 16th century, but it seems to have become more popular in the 1700s.